Lord Matic was a mainstream line for Seiko in the 1970s, moving downmarket a bit as their quartz pieces grabbed the attention. Seiko seems to have made a conscious effort to develop new case shapes and markers that belie the traditional round movements found inside. This 5606-5010 is a great example of that. In person, the long-and-narrow shape says “anything but your father’s round watch”, a point emphasized by the horizontal bark markers. 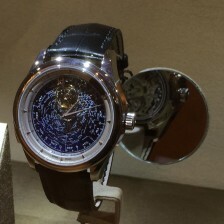 And the tall crystal and slanted polished case pull the eye away from the circular rotation of the hands. The Lord Matic is very much a product of its time, much like the “Emerald Jewel” Lord Matic I wore last week. A decade ago, 1970s pieces like this were the epitome of uncool, but the times are changing. Seiko recently launched the Recraft SNK line inspired by this very heritage, with green, red, blue, and brown dials and funky markers. And I’ve been getting more likes on my vintage Seiko collection than my mainstream modern watches. Another great thing about vintage Seiko watches is how cheap they are. Watch carefully and you’ll find Lord Matic watches online for under $100. The 56 stream movements used in most is robust and reliable, with easy automatic and hand winding and almost too-light setting. And they have modern features like crown quickset date and day wheels. Frankly, they’re better movements than the 7S26 still used in inexpensive Seiko automatics today like the SNKM97 pictured here. On the other hand, they don’t hack (but neither does the 7S26) and the date advance will break if you set it around midnight. Another issue with vintage Seiko watches is the mix-and-match “refurbishment” most have had. Many have the wrong movement inside, and many of these have been repaired with a hodgepodge of used parts. The same happens to the bracelets, which are often swapped out for new buyers. Mine is currently wearing a cheap folded steel bracelet I got on another watch, but it came with a “plate” style bracelet. If it wasn’t for the weird fit around the lugs I might have left that one on the watch: It looked weirdly cool. I don’t find myself wearing this watch much, but I’m glad I have it. It’s a fun little piece and doesn’t take up much space in my life. That’s one thing that’s nice about collecting watches! Still, I’ll reach for it every few months and give it a spin.